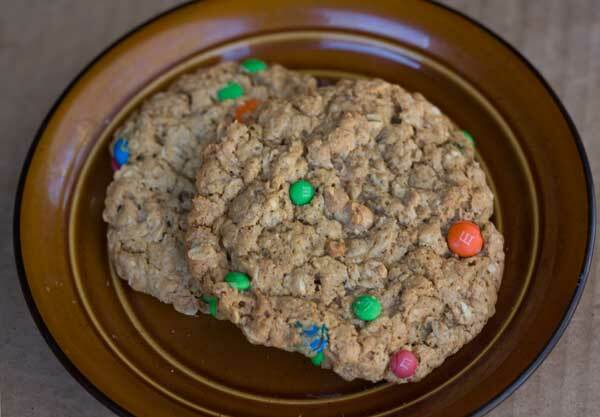 From King Arthur Flour, this recipe makes large oatmeal peanut butter cookies packed with candy. Preheat oven to 350 degrees F. Line two or three baking sheets with parchment or nonstick foil. In a mixing bowl, stir or whisk together the eggs, sugars, vanilla, corn syrup, baking soda and salt. Stir in melted butter and peanut butter, followed by oats and flour. Stir in all the chips and candy. Let dough rest for 30 minutes. Drop the dough by 1/4 cupfuls onto baking sheets. Use fingers to flatten the cookies slightly, then bake them for 12 minutes or until they're a light golden brown. Remove from the oven and cool on a rack. For crunchier cookies, try baking at 325 for 18 to 20 minutes.